The development of affordable software-based audio processing tools has bought the previously mysterious art and science of mastering to the masses. Whether it's really ideal to master your own finished tracks in the same (perhaps less than optimal) monitoring environment in which they were recorded and mixed is debatable but, for whatever reason, if you're undertaking your own mastering it makes sense to use tools designed specifically for the task. Some third-party plug-ins have become widely established, including Izotope's Ozone, IK Multimedia's T-Racks and processors from Voxengo and Waves; many others are available, and most of the major DAWs now include similar tools as standard. DMAX Audio are a new company entering this field, with an initial catalogue comprising four plug-ins. The DMAX peak limiter is based upon an algorithm Andrew Startsev, DMAX Audio's main man, wrote for use in his own studio and has now developed commercially. The three other plug-ins are DEQ Type A, a 10-band graphic stereo EQ; DLIM, a brickwall loudness maximiser; and DSE, a stereo enhancer. Currently, they are VST only, with both 32- and 64-bit versions on the PC and 32-bit only for the Mac; Audio Units and RTAS versions are planned but, as yet, no timescale is suggested. DMAX is a lookahead brickwall peak limiter. Its custom algorithm, according to the documentation, is designed to preserve both stereo imaging and transients. The PDF manual also suggests that DMAX is best suited to drum and/or percussion tracks, or mixes with these elements, rather than to other individual instrument or vocal tracks. As illustrated by the screenshot, the interface styling has a certain retro feel, and this is carried over into all the other plug-ins in the suite. There are three key controls offered: Threshold, Ceiling, and a series of buttons that let you choose a threshold frequency above which the limiting does not process the signal. 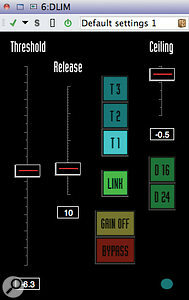 The idea is that you can apply control only to the lower-mids and bottom end of your mix if you so wish. As might be expected, the Ceiling fader sets the maximum amplitude of the output signal and is adjustable in 0.1dB steps down to -3dB. The Threshold control is where most of the action is: as usual, lower settings generate higher overall output levels. Again, this is adjustable in 0.1dB steps, but this time down to -12dB. 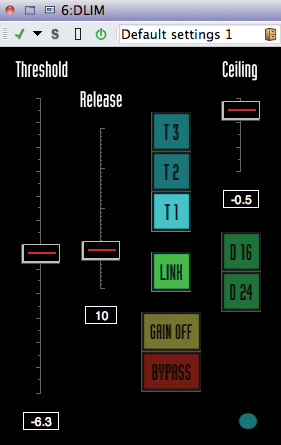 Other controls include the option to engage 16-bit or 24-bit dithering, a Gain Off button (which switches off make-up gain so you can compare the processed and unprocessed signals at similar volume levels) and a Bypass button. The Fast button engages a less processor-hungry version of the algorithm if you are using DMAX in a mix that is pushing your system close to its limits. 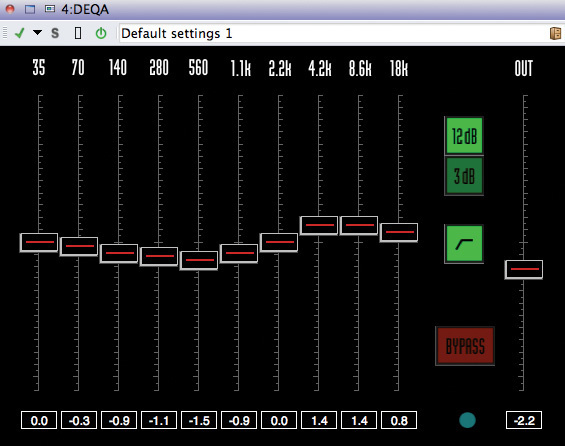 The obvious thing missing from the DMAX interface — indeed, from all the plug-ins within the suite — is any form of metering. You might argue that decisions about how hard to push this kind of processing should be made entirely by your ears rather than your eyes, but most rival products do feature sophisticated metering, and I personally find it useful. I tested DMAX with a range of different audio material within Wavelab, and it did pretty much what you would expect. Lowering the threshold fader generated gradually louder output and, to my ears at least, in the first half of the fader's travel, the end results seemed fairly natural and easy on the ear, raising the volume without introducing anything too unpleasant in terms of audio artifacts. Compared with my usual weapon for this work — Ozone's Loudness Maximiser — I had to push DMAX's Threshold settings a little harder to achieve the same amount of gain increase and, if I was just trying to create the loudest end result possible, Ozone outdid DMAX by some distance. That's not to say this is a good thing to do, of course! As an example of what this plug-in can achieve, the second screenshot shows a short waveform extract from a full mix (a rock track) processed via different settings in DMAX. Waveform extracts generated within Wavelab. Each shows the same section of the original track. From top to bottom they show: original track with no processing; DMAX with Threshold at -6dB; DMAX with Threshold at -12dB; DMAX with Threshold at -6dB and volume auto-compensation off; Ozone Loudness Maximiser with -6dB Threshold. I would be more than happy with the result of the -6dB Threshold version — it was louder but did not sound obviously processed — but the -12dB, while louder again, sounded less pleasant to my ears. A version with the volume auto-compensation off shows lower amplitude variations than the original audio (the differences between the loudest peaks and the average level are significantly reduced) but without the overall hike in level. For comparison, the track's waveform after processing through Ozone's Loudness Maximiser with a threshold at -6dB is clearly 'louder' than the -6dB DMAX version, reflecting what are obviously differences in the algorithms being used, although the Ozone version also had no obvious artifacts that might detract from the average punter's listening experience. DLIM provides an alternative approach to increasing the loudness of your track. The Threshold and Ceiling controls operate as with DMAX, but you also get a Release control: low values produce the fastest response (suitable for drum-dominated material), while higher values are more suited to sources with less obvious transients. The plug-in also offers three modes called T1, T2 and T3 which, presumably, apply somewhat different algorithms. The documentation explains how these different modes alter the frequency range in which any distortion is applied but, with my test material at least, the differences between the modes seemed very subtle, and Wavelab's File Comparator tool confirmed this impression. Comparing files processed with similar Threshold settings in DMAX and DLIM, I generally preferred the sound of DMAX. Indeed, when DLIM was pushed a little harder, I found I could begin to hear its workings just a little too obviously for my taste. That said, in the 0 to -6dB Threshold range the results sounded good. 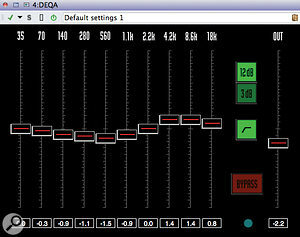 The DEQ Type A plug-in provides a mastering-quality, 10-band graphic stereo EQ. The algorithm is intended to retain transients on drums and percussion and to work well with complex audio signals. The retro styling of the interface is dominated by the 10 frequency-band faders and the main output fader; this offers ±12dB gain, while the frequency faders can be switched between offering ±3dB or 12dB at full throw. The 3dB setting is useful for more detailed work, but do be aware that if you switch from the 12dB mode to the 3dB mode, any changes you had already made over the 3dB range are reset to the 3dB maximum. The interface includes a couple of nice touches. Holding the Shift key and clicking on a fader toggles the processing for that band off, allowing you to A/B what your setting for that band is doing to the overall sound. In turn, holding the Alt key and clicking solos a band — again, useful to hear exactly what the EQ is doing. And there is, of course, the Bypass button. Finally, the Low Cut button switches the lowest EQ band between bell and shelf format. In use, I've no issues with the sound of DEQ and, given the simplicity of use offered by a graphic EQ design, it is much less intimidating to use than, for example, Ozone's Parametric EQ module. 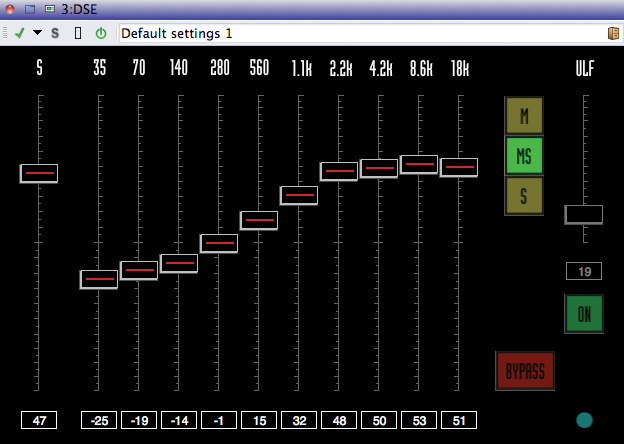 That said, Ozone's offering has features that DEQ doesn't, including metering and EQ curve matching tools. DSE is a stereo enhancer based on side-channel (S-channel) equalisation, with faders to set the amount of enhancement for each of the same 10 frequency bands used in DEQ, plus an 'S' fader which sets the overall enhancement level. In each case, the fader range goes from +100 (maximum stereo effect) to -100 (making the signal more mono). 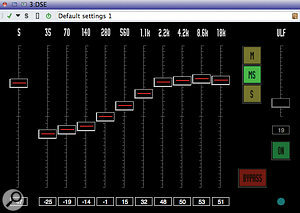 Three buttons allow you to toggle between monitoring in mono (M), the full signal (MS) and the sides component only (S). A Bypass button is also included. The other control is a fader labelled ULF, which is said to add ultra-low frequencies to the Sides channel, supposedly to enhance the overall stereo effect. This is an unconventional idea, to say the least, as the usual wisdom is to keep the low frequencies firmly in the centre of the stereo field, and on my monitoring system, the effects were inaudible. Unfortunately, the manual does not explain it in a way that makes clear why you would want to do it! Stereo enhancement is one of those effects that you really have to be careful doesn't get the better of you. You apply a little bit and it sounds good, so you apply a little more and it sounds better... and, before you know it, everything is set at maximum, the original sounds somewhat flat by comparison and your ears have lost their ability to tell you when enough is enough. At least with DSE, it is easy to bypass the processing and to check mono compatibility. All that said, I rather liked what this plug-in was able to do in terms of teasing out the stereo image without making the sound too obviously processed. In comparison to my usual stereo enhancement tools within Ozone, DSE is perhaps easier to use and harder to abuse, although both give good results, provided you don't overcook things. DMAX Audio's first releases are a rather enigmatic set of plug-ins. Used with care, each is capable of doing a decent job, but I do wonder if DMAX Audio couldn't perhaps explain the advantages of the particular designs more fully for the potential purchaser, whether in the documentation, or via some comparative audio demos on their web site. While it is, of course, the sound that matters, giving potential users a better understanding of what each of the processors can do (and a little bit on how they do it) must surely be a good thing, especially if you are launching new products into an already competitive market? That said, for general (and gentle) DIY mastering tasks, sonically, I'd be quite happy to use these plug-ins on my own material and, of the four, I feel DMAX and DSE are the most useful. I suspect those new to the wonders of mastering would find the fairly streamlined control sets less baffling than some of the more complex alternatives. User interfaces are a matter of personal taste and, while I've no personal objection to the somewhat retro styling, a more whizz-bang look might appeal to some potential users, as might some metering options. As to the more difficult question of whether potential users would choose these plug-ins over and above tools they already own or are familiar with, I'm less convinced. Cost would, of course, also come into any purchasing decision and, while DMAX Audio offer discounts when purchasing more than one plug-in, some of the established products are very competitively priced (for example, the standard version of Ozone 5 currently sells at $249). DMAX Audio provide demo versions of all four plug-ins for download, however, so it's easy to try them for yourself. Streamlined interface will appeal to some. Used with discretion, these plug-ins can produce good results. Fewer options than some of the established competition. DMAX Audio's mastering plug-ins are easy to use and uncomplicated, but in a competitive market it's not always clear what their unique selling points are. DEQ Type A $89.95; DLIM and DMAX $99.95 each; DSE $49.95. Discounts available when buying more than one plug-in. Apple iMac with 3.4GHz i7 CPU, 16GB RAM and TC Electronic Konnekt 24D interface, running Mac OS 10.7.5. Tested with Steinberg Wavelab 7.2.1.